For a long time it was realized that the earth's surface was curved by people familiar with the behavior of incoming and outgoing ships. For it was obvious that as a ship passed over the horizon, the hull disappeared first, then the topmost sailing masts (although one could argue this is an effect of refraction in the atmosphere). Ancient astronomers could see with their eyes that the Sun and the Moon were round. And the shadow of the Earth, cast on the lunar surface during a lunar eclipse, is curved. A sphere is the simplest shape to explain the Earth's shadow (a disk would sometimes display a shadow shaped like a line or oval). Eratosthenes used a spherical Earth model, and some simple geometry, to calculate its circumference. Eratosthenes knows that on a special day (the summer solstice) at noon in the Egyptian city of Syene, a stick placed in the ground will cast no shadow (i.e., it is parallel to the Sun's rays). A stick in the ground at Alexandria, to the north, will cast a shadow at an angle of 7 degrees. 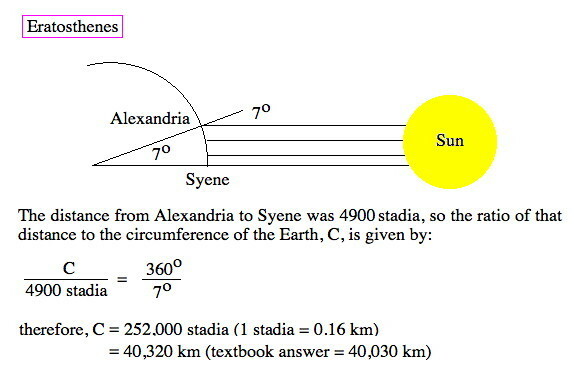 Eratosthenes realizes that the ratio of a complete circle (360 degrees) to 7 degrees is the same as the ratio of the circumference of the Earth to the distance from Alexandria to Swenet. Centuries of surveying by Egyptian pharaohs scribes gave him the distance between the two cities of 4900 stadia, approximately 784 kilometers. This resulting in a circumference of 40,320 kilometers, which is amazingly close to the modern value of 40,030 kilometers. With this calculation, Eratosthenes becomes the father of geography eventually drawing up the first maps of the known world and determining the size of the most fundamental object in the Universe, our own planet. 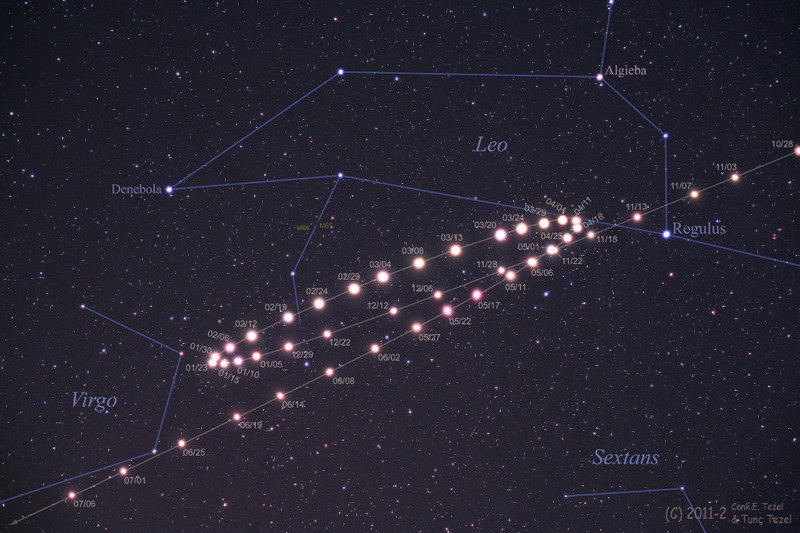 Aristarchus was the first to propose a Sun centered cosmology and one of the primary objections to the heliocentric model is that the stars display no parallax (the apparent shift of nearby stars on the sky due to the Earth's motion around the Sun). However, Aristarchus believed that the stars were very distant and, thus, display parallax's that are too small to be seen with the eye (in fact, the first parallax will not by measured until 1838 by Friedrich Bessel). The Sun is like the fixed stars, states Aristarchus, unmoving on a sphere with the Sun at its center. For Aristarchus it was absurd that the "Hearth" of the sky, the Sun, should move and eclipses are easy to explain by the motion of the Moon around the Earth. Ptolemy (200 A.D.) was an ancient astronomer, geographer, and mathematician who took the geocentric theory of the solar system and gave it a mathematical foundation (called the "Ptolemaic system"). 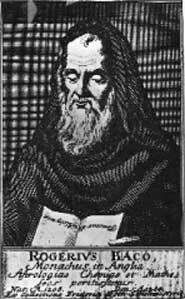 He did this in order to simultaneously produce a cosmological theory based on Aristotle's physics (circular motion, no voids, geocentric) and one that would provide a technically accurate description of planetary astronomy. Ptolemy's system is one of the first examples of scientists attempting to "save the phenomena", to develop a combination of perfect circles to match the irregular motion of the planets, i.e., using concepts asserted by pure reason that match the observed phenomenon. At the end of the Greek era, there is no doubt that we completed our transition from mythical, supernatural explanations of cosmology to a natural, science based description. And, it is clear, that the mathematical description of the cosmos given by Ptolemy is, in the words of the mathematical Wigner, "unreasonably effective", meaning that is mathematics is a surprisingly successful to understand the natural world, beyond our expectations given the chaos that reigns in everyday phenomenon. This is the ultimate verification of the Greek philosophical tradition which asserts that nature is understandable rather than under the control of capricious deities which are to be appeased rather than understood, is one of the roots of science. Thus, the greatest gift from the Greek was the philosophy of rationalism, that the Universe is open to inspection and, ultimately, understandable. It is of continuing amazement, to both scientists and philosophers alike, that the laws of Nature can be expressed in mathematical form, and that humans are capable of processing that kind of math. However, while no one doubts the importance of mathematics to science, there is a continuing debate on the origin of math's effectiveness. On one hand, we see Plato's belief that mathematical ideas exist independent of our world, or human thought (the realist or Platonism view). In fact, for Plato, the real world is this mathematical world, not the shadow, physical world we live in. Aristotle, on the other hand, believes that math is a human invention, and that the mind is where math is created (the instrumentalist or formalist view). Humans created mathematics by idealising or abstracting elements of the physical world. In fact, mankind's extraordinary math abilities may simply be the product of millions of years of evolution providing us with powerful intellectual tools as a survival asset. A modern view of mathematics and science is provided by Bertrand Russell who states "Mathematics is the chief source of the belief in eternal and exact truth, as well as a sensible intelligible world". This is a guiding principle for most scientists and mathematics. Scientists do create methods to quantify phenomenon in physics, chemistry and biology, and these inventions are effective. However, it should be remembered is that these mathematical methods are, in many cases, incredible accurate. So as phenomenon is studied and recorded, and as patterns emerge (via the scientific method), humans will take mathematical concepts from abstracting elements and apply them to problems. But the discovery is in the connections to science, not the mathematical objects themselves. The bottom line about the relationship of mathematics to science is basically that math works. 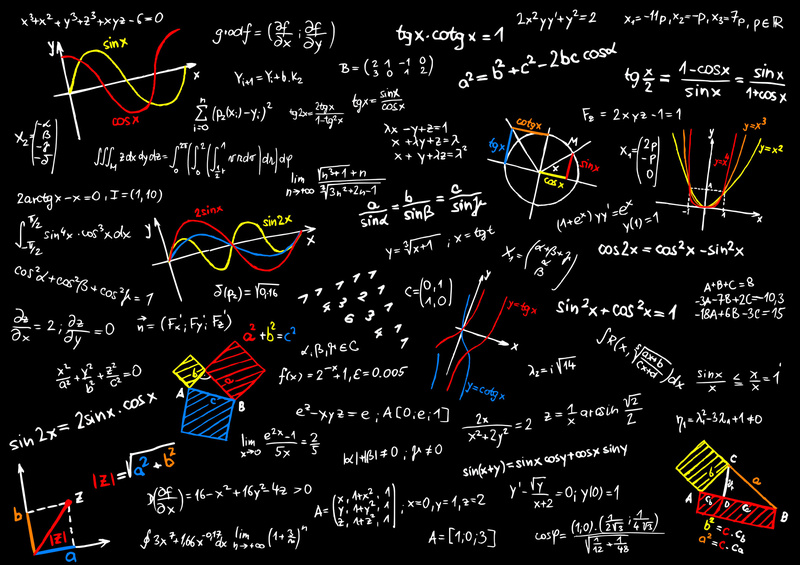 Mathematics is very much a part of the Universe and very necessary for understanding cosmology. For we will see, in later chapters, that there are properties to the Universe can only be understood through mathematics. For example, our senses and mental models are fixed in a three dimensional world (3D), and the macroscopic Universe is the four dimensional (4D) construct called spacetime. To explore spacetime requires an extension to our senses that only mathematics provides. The mathematics of the Greeks was geometry and arithmetic, but as we advance forward in the history of cosmology we will encounter more sophisticated mathematics. Newton will introduce calculus, the math of infinitesimals. Einstein will introduce non-Euclidean geometry. Quantum physics uses differential equations and matrix algebra. These math methods are the windows in which we see, and understand, reality. By the 21st century, we will see a heavy usage of computers and artificial simulations to probe the vast amount of information provided by new technologies. And our sense of how we do science will change as encounter new concepts which are not testable in the traditional sense of direct observation or experimentation. However, common to all cosmological investigations from the Greeks to modern times was an appreciation of the regularity of Nature. That Nature has, within itself, mathematical patterns that could be expressed as laws of Nature (the law of gravity, the law of conversation of energy, the Ideal Gas law, etc.). The idea that physical entities obey laws is a strictly Western invention for Eastern cultures would find it absurd for inanimate objects "understanding" laws. The period between the fall of the Roman Empire and the start of Renaissance in the 14th century is known as the Dark or Middle Ages. While the Middle Ages were considered a time of scientific stagnation due to the recurring political and social upheavals of the time, their was a continued steady progress in intellectual thought in Europe and surrounding kingdoms in the Mideast and India. While the Catholic Church dominates most knowledge enterprises during this era, their influence was not as suppressive as popularly portrayed and various Church institutions were mostly responsible for the preservation of cosmological ideas from the Greeks. Dante's 'Divine Comedy' is an epic poem dealing with an allegorical vision of the afterlife and Catholic world-view. Based on the Aristotelian model, the Earth in the 'Divine Comedy' is at the center of the Universe, surrounded by whirling spheres made of transparent solid matter. Added to the Aristotelian eight spheres is a ninth sphere, the primum mobile or "first moved", the source of the movement of all the inner planetary spheres. Beyond the primum mobile lies the spiritual Universe, the mind of God or Empyrean heaven, thus this sphere marks the boundary between the natural and supernatural worlds. Dante's cosmology is divided into three sections, based on theological doctrine, Inferno (Hell), Purgatory and Paradise. The physical layout is such that Lucifer defines the very center of the Universe and God is found in the outer region. Inside the Earth is found Hell, divided into nine circles for increasing levels of sin. Between the surface of the Earth and sphere of the Moon lies Purgatory (a mountain divided into seven terraces, displaced from the Earth when Lucifer fall created Hell). Above Purgatory lies the spheres of Heaven, each describing a deficiency in one of the cardinal virtues. The Moon, containing the inconstant, whose vows to God waned as the moon and thus lack fortitude; Mercury, containing the ambitious, who were virtuous for glory and thus lacked justice; and Venus, containing the lovers, whose love was directed towards another than God and thus lacked Temperance. The final four incidentally are positive examples of the cardinal virtues, all led on by the Sun, containing the prudent, whose wisdom lighted the way for the other virtues, to which the others are bound (constituting a category on its own). Mars contains the men of fortitude who died in the cause of Christianity; Jupiter contains the kings of Justice; and Saturn contains the temperant, the monks who abided to the contemplative lifestyle. Despite the main focus on religious concepts in the 'Divine Comedy', a great deal of physical cosmology is outlined that merges religious doctrine of the time into the Ptolemaic system with scientific additions that parallel the discoveries from the time of Aristotle. For example, there are numerous references to a spherical Earth and changing constellations with latitude and varying timezones. The connection between the supernatural and the physical in Dante's cosmology mimics the Platonic viewpoint of the physical world being a copy of the world of Forms. Here the planetary spheres copy the angelic hierarchies that rotate around God (and the circles of Hell are a parody that rotates around Satan). Even the geocentric Universe is simply an imperfect copy of the spiritual form of Paradise, a theocentric Universe where the angels that power the motion of the planets are actually revolving around God, who illuminates all things from the center. With perfect symmetry in both physical and theological space, Dante's cosmology represents the peak in medieval cosmology blending the Ptolemaic system with Christian doctrine. Copernicus (1500's) reinvented the heliocentric theory and challenged Church doctrine. Copernicus (c. 1520) was not the first astronomer to challenge the geocentric model of Ptolemy, but he was the first to successfully formulate a heliocentric model and publish his model. He was able to overcome centuries of resistance to the heliocentric model for a series of political and scientific reasons. Politically, the authority of the Church was weakening in Northern Europe in the 15th century allowing more diversity in scientific thinking (although the new Protestant faiths were also not quick to embrace the heliocentric model). Scientifically, a better understanding of motion (particularly inertia) was undermining the whole concept of an unmoving Earth. A rotating Earth is a much simpler explanation for the durnal motion of stars, an Earth that rotates is only one step away from an Earth that revolves around the Sun. The heliocentric model had a greater impact than simply an improvement to solve retrograde motion. By placing the Sun at the center of the Solar System, Copernicus forced a change in our worldview = paradigm shift or science revolution. While Copernicus includes a rotating Earth in his heliocentric model, he continues to cling to Aristotle's celestial motions, i.e. orbits that are perfect circles (rather than their true shape, an ellipse). This forces Copernicus to adopt a series of moving sphere's for each planet to explain longitude motion. While Copernicus has fewer sphere's, since more of the retrograde motion is accounted for, his system is still extremely complicated in a computational sense. It's two greatest advantages is that it places the inferior planets near the Sun, naturally explaining their lack of large eastern or western elongations, and removing any extreme motions, such as that needed to explain durnal changes. Copernicus also changes the immovable empyrean heaven into a fixed sphere of stars, severing theology from cosmology. However, Copernicus fails to produce a mechanically simple scheme for astrologers to cast horoscopes or astronomers to produce almanacs, for ultimately the tables he produces are as complicated as Ptolemy's and he did not publish all his results in the final edition of his work, "On the Revolutions of the Heavenly Spheres".